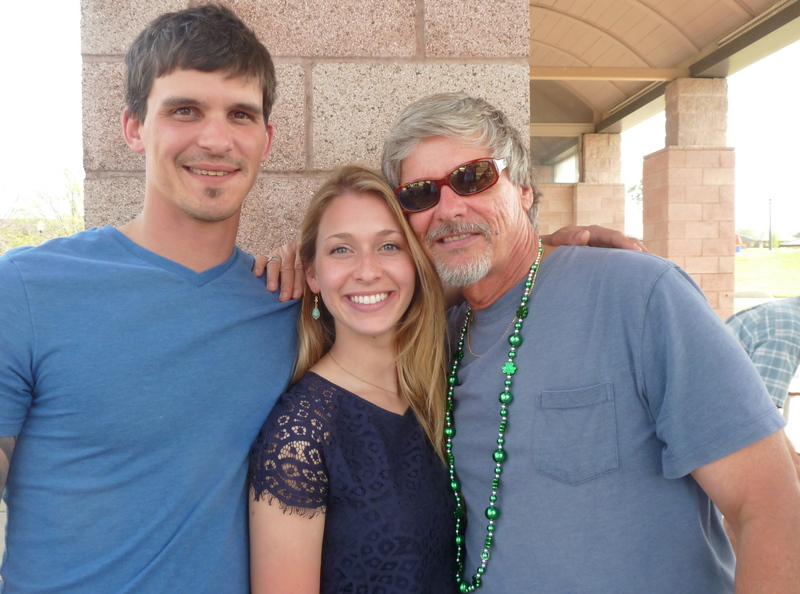 Reunited with the McKay bloods of my blood back in Texas: Old hippie dad with his son Adam McKay (an Iraq War veteran/Marine) and youngest daughter Megan McKay, she who is getting married in October. Americans will want to lock their doors the week of that McKay wedding wingding. Be afraid. Be very afraid. 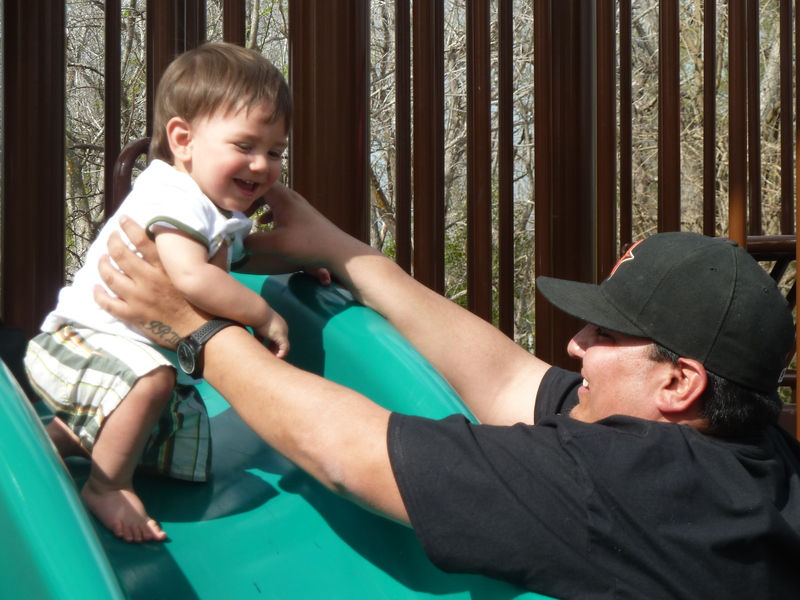 Another McKay blood free spirit: 1 year old Rhys Rodriguez, your favorite blawger’s youngest blood (grandsons div.) 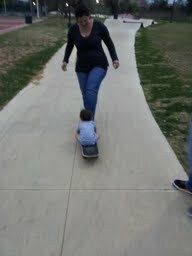 has already mastered skateboarding. 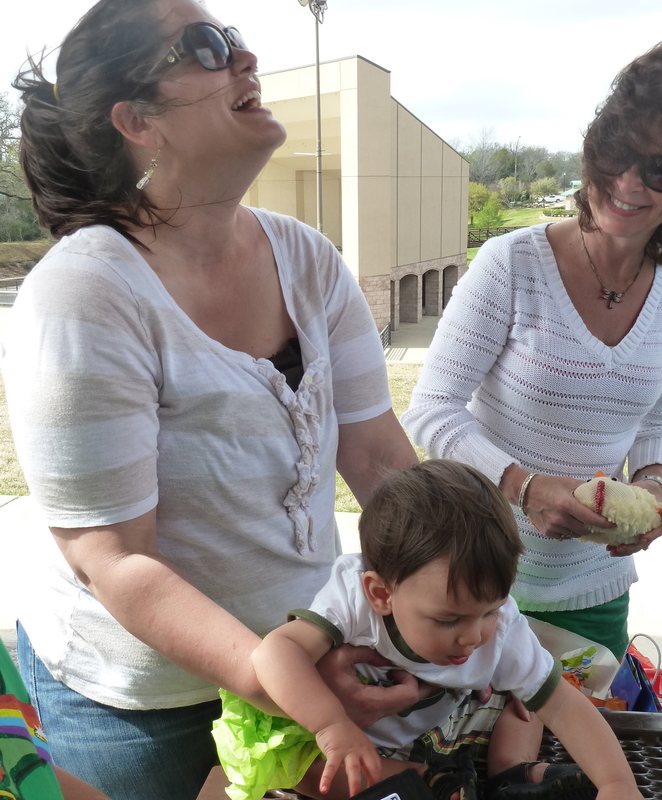 He’ll thrive in Belize, the land of free-spirited adventurists like him and PawPaw. 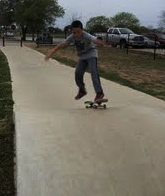 Ditto Trey Rodriguez, 10, Rhys’s big bro. 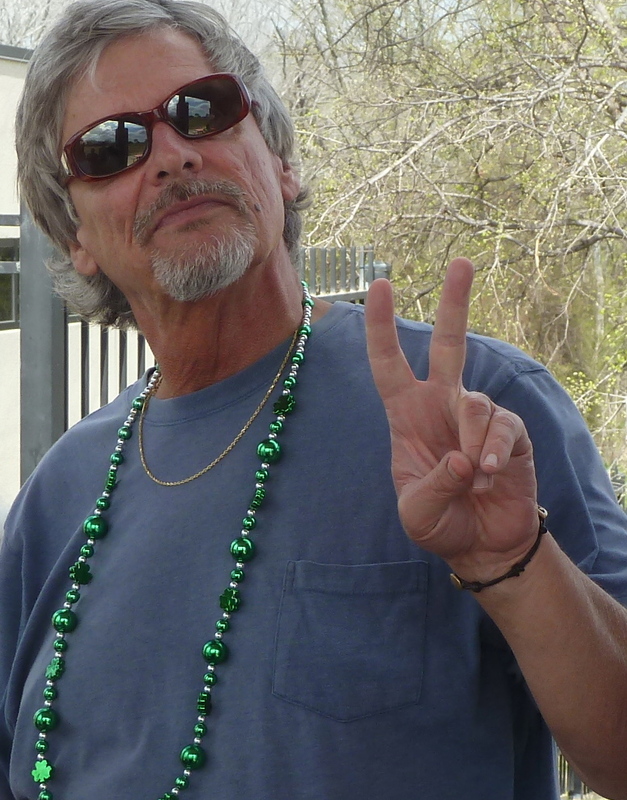 Both the bloods celebrated their March birthdays when I was on the Magical Mystery Tour of Texas. So you didn’t think your favorite blawger was gonna come back from two weeks of his Magical Mystery Tour in the greatest nation on earth, Texas Our Texas, without some family postcards, did you? 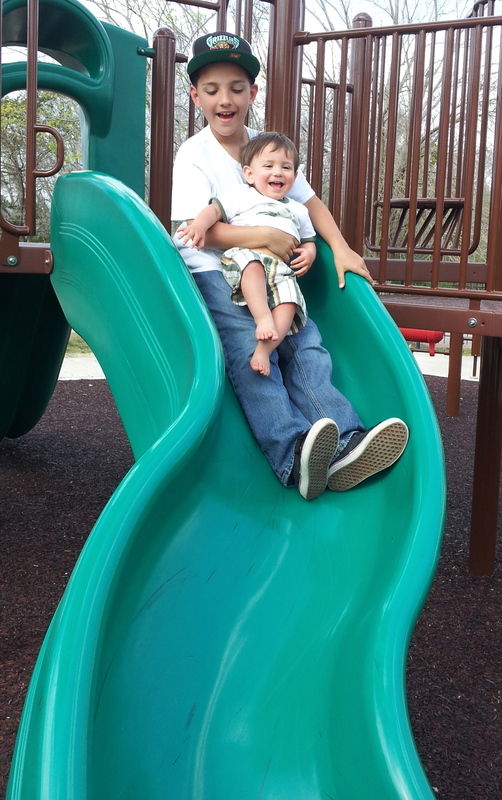 Birthday boys having a large time. Scattered below are some of the family postcards and some random stuff about some of this and some of that for you too, starting with a blurb about Francis Ford Coppola, who’s a Belizean-American. Which means he owns many hammocks and drinks lots of the National Beer of Belize. 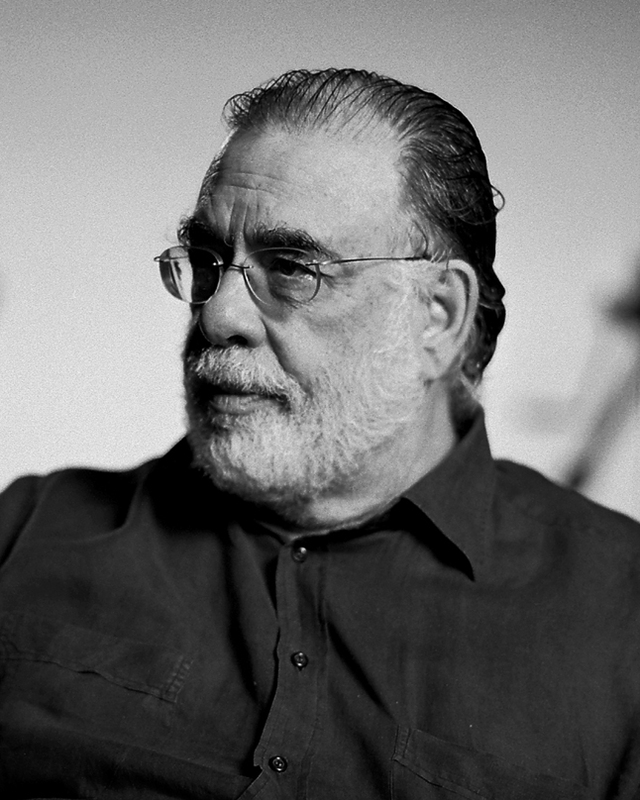 His Greatness the totally original, supremely creative adventurist Francis Ford Coppola. He and I share a lot in common: both live in Belize(he in Belize among other places on the globe), both like the National Beer of Belize, and both eat organically grown tropical fruit a lot. Really about the only difference between me and him is, he has more money than God. You might say he’s the Godfather of dough. I’m a poor boy from Navasota, Texas who has to budget his national beer money down here. Here’s a quote from His Greatness the film director-turned-winermaker and first-class Belizean resort maker Francis Ford Coppola on his first trip to Belize way back when (1981). 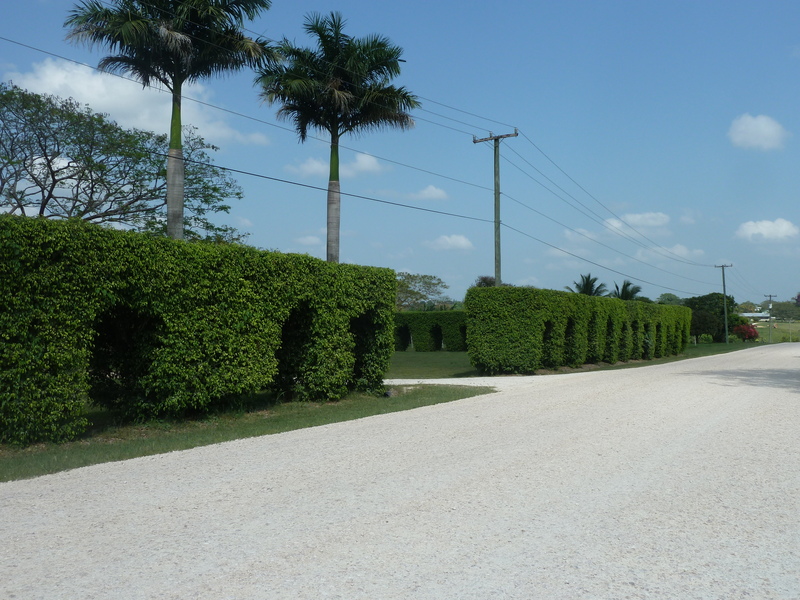 He’s talked often about how he fell in love with Belize and loves it still. That happens–it’s a very seductive country to a lot of us who, for whatever reason, get swept away by this weird, original, confounding, peaceful and friendly Eden of a country. Click here for a look at one of the divine Coppola resorts, definitely not in this Belizean-Texan’s budget. 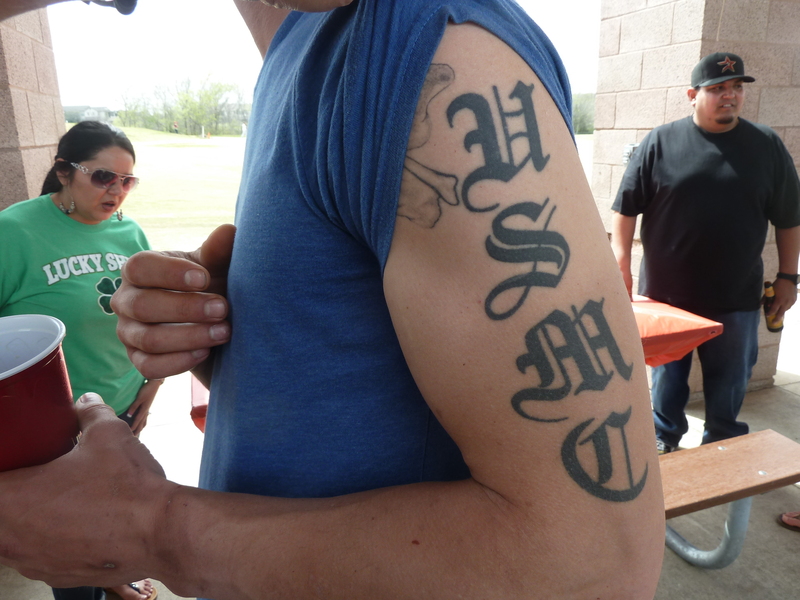 Adam carries his Marine love on his sizable bicep. On a sadder and serious note, speaking of Marines, the accident that killed seven of them in Nevada seemed to me to receive scant news coverage with all the political wars in D.C. and the usual celebrity news dominating the news. Click here for their profiles and send up prayers for them and those hurting love ones of theirs. Hard to imagine how hard it must be for those families. And back here in Belize . . . . 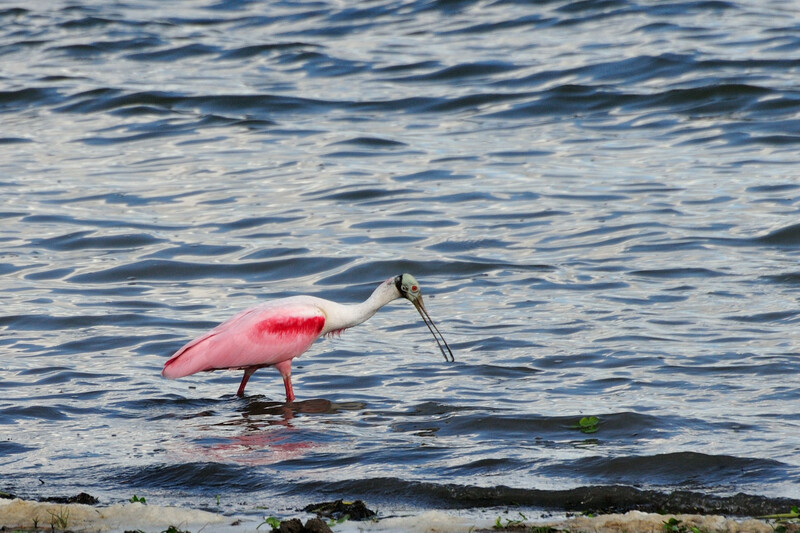 If you like birds, butterflies and pretty pictures–and longtimers of the Jitterbug Cult know that your cult leader likes nature and pretty pictures a lot, click here for some pretty Belizean pix at this blog site from photographer Joe Schelling that I stumbled upon. 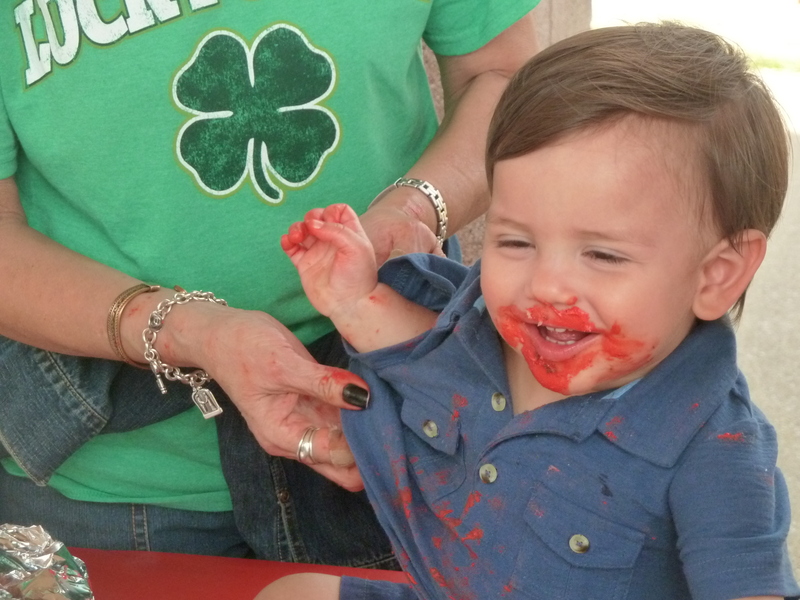 A word to the wise: Free your mind, body, spirit and soul–and always dive fearlessly into your birthday cake like baby Rhys did on his first birthday wingding. And birthday boy with Papa Jorge. 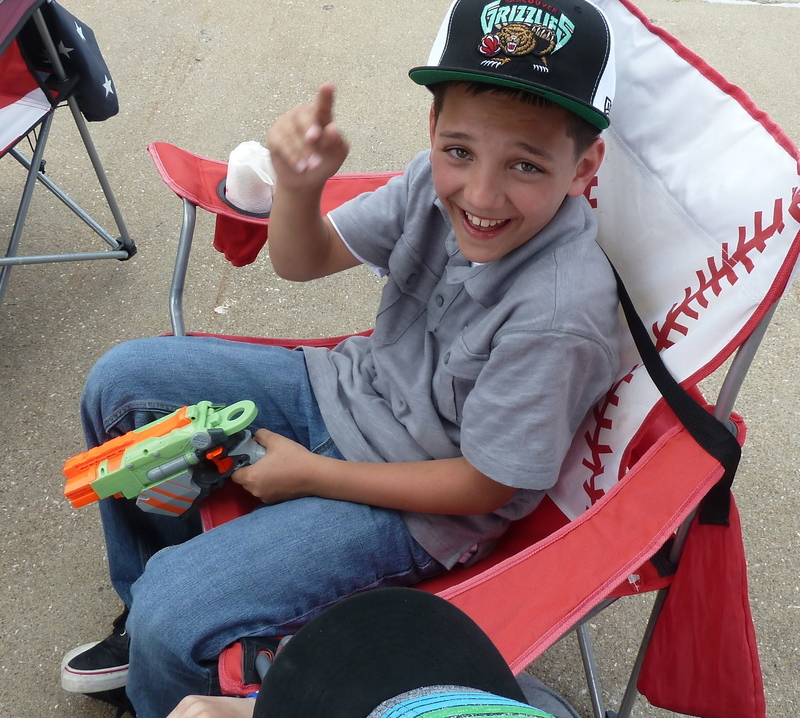 Good luck catching a 10 year old in repose on his birthday. This picture taken of Trey-Hey sitting down must have been taken by accident. Been posting today over lunch from Hode’s fabulous Bar & Grill in San Ignacio (click here and also see here), where they just started playing Lionel Ritchie music. This is a sure sign that it’s time for me to pay out and get my motor running. What a shame that folks are more interested in the “scandulous” dress that Ashley Judd wore to some function (it just looked like an evening dress to me) and those poor Marines get zip point zero. I am with you on that one buddy. Take care of yourself! Saw the very classy dress (thanks for sending) and I’ve been to highfalutin GOP fundraising events and charity balls and things dominated by conservative Republicans where the women revealed, way, way more. It shows how scared to death these men are of a strong, smart, tough-minded woman and Ashley Judd is as smart, strong and tough-minded as they get. Like smart, strong and tough-minded Hillary she scares the wits out of them and will be handing them all their hats at election time with all that strong-woman hate of theirs. Remember you read it here first–she’ll win unless they find a way to keep her of the ballot and they are staying awake nights trying to figure out how to block her. Very strange days in the homeland. It’s just astounding. Personally, I love intellect. It is one of Kristen’s best attributes. I don’t want to brag but she graduated from the College of William & Mary and they do not accept average students. W&M was chartered before Harvard but Harvard opened sooner – dagnabbit! It is unfortunate that the death of the Marines in Nevada was essentially glossed over. If that had happened in Afghanistan, it would have gotten far more coverage. I’m not sure why locale should drive the amount of coverage, unless some media types are using overseas military casualties to push their own agenda. You’re probably right about that. But even if it had gotten more coverage in Afghan, I’m not sure there would have been much interest in it among the news consumers (i.e., what used to be the citizenry, which the media used to try to reasonably inform and somewhat objectively and accurately; says a lot that they’re now considered news consumers).. All that enthusiasm and support for war after 9-11 really dissipated and people are so war weary, it seems to me, that they don’t even want to hear about this stuff anymore. Certainly the politicians don’t want to touch war or military stuff these days except for a few hawks upset about the cuts in military budget, which has always been sacred and off limits as if there’s no waste there. But as you alluded, the media all do have their distinct agendas that they push hard these days. And then there’s the overwhelming celebrity “news.” Jack Nicholson sold his house in Colorado; that made “news” the day of the Marines accident. Don’t get me started. I won’t get you started, because it will only cause my blood pressure to go up, as well. To paraphrase an old saying, we get the media we deserve. And I’m a big fan of William & Mary – any school that can count Thomas Jefferson, James Monroe and John Marshall among its former students has my attention.. I just wanted to introduce myself (“Hi, I am Louis Ogden and I live in South-Central Virginia”) because it seems that we may have a few things in common. I have seen your name on Paul’s blog quite a few times but felt compelled to officially meet you after your comment re W&M. I also am a W&M fan, as you can easily see, and we have Thomas Jefferson as an interest in common. I also am VERY fond of his buddy, James Madison. I have been to your blog and read your “About Section” and am assuming you are from South Carolina (correct me if I am wrong). If that is the case; however, then we have something else in common. I live on an old farm that has been sub-divided into large parcels (mine is 16 acres for instance). My nearest neighbor owns “the old farmhouse” on 35 acres that once belonged to an Edmund Ruffin, a noted Virginia agronomist and secessionist who claimed to have fired the first shot on Fort Sumter. Actually that is a “rural myth” but he did play a large role in the Civil War and I laughingly refer to him as the South’s first “good ole boy.” Another myth about this redneck fellow that is still widely believed here in Virginia is the most interesting and comical. Mr. Ruffin (it is said) was so distraught at the end of the war that he wrapped himself in the Confederate Flag and set himself on fire. I’ll bring this dissertation to an end here, but I’m pleased to meet you and hope to cross paths again. Actually, I’m sure that we will as I am leaving here and subscribing to your blog. In closing, any friend of the good Rev. Paul is a friend of mine as well! Thanks for sending the followup link to your earlier note, Louisva. I am indeed in South Carolina, and wouldn’t want to be anywhere else, though I do enjoy visiting other places on occasion. There’s nothing like being 10 minutes from a medium-sized city and 10 minutes from the middle of nowhere. It’s getting harder and harder to find places like that any more.